Active hardy and full of character, catfish can make a delightful addition to any aquarium. Whether you're looking for sociable members of a community tank or just somebody to eat up that troublesome algae, there's almost certainly a catfish for you.Catfish are notable for having thick, leathery skins, often beautifully patterned, rather than scales. 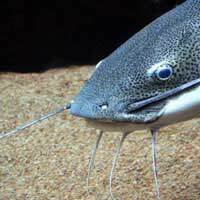 They also have barbels, whisker-like appendages which provide them with a great deal of sensory information. They are quite physical creatures and you should not be disturbed if you see them trying to touch other fish or even your own hands when you're cleaning the aquarium. Although they may vary a great deal in their habits, most catfish have certain basic things in common. Since they are bottom-dwelling fish they prefer a soft substrate such as sand or smooth gravel; they often enjoy having larger polished stones to sit on. Make sure that they have plenty of hiding places available. Pieces of bogwood can provide shelter and also give them something to chew on, helping to keep their mouthparts in good condition. Otocinclus -Small and peace-loving, happiest with several of its own kind, this attractive stripy fish is a great algae eater. A golden variety is also available. Zebra Pleco -With its stunning black and white markings, this beautiful fish is an aquarium favourite. However, it doesn't eat a lot of algae, preferring meaty foods. It does best in a tank without other bottom-feeding fish. Cory -Available in several varieties, this popular fish prefers to be in a group of its own kind, though it is non-aggressive with other fish. Its diet needs to be supplemented with frozen or live meaty foods. Bristle-nosed Catfish -A great algae eater, this active fish will also eat any other food which drifts down to the bottom, reducing the risk of pollution in your tank. It is also easy to breed. Clown Catfish -Popular for its striking markings, this is a highly active fish which maybe territorial with other bottom dwellers. Although most species of catfish eat algae, it's still important to make sure that they're getting all they need, and they generally benefit from being provided with food pellets or algae discs. Since most species are nocturnal it's best to feed them shortly after lights out - this will also discourage other fish from stealing all their food. If you have an armoured catfish it's especially important for you to make sure it's eating, as you may not notice if it's losing weight - its armour won't shrink just because it does. Catfish sometimes suffer from bullying by other fish and may become aggressive in response. If you suspect this is happening, make sure to observe the tank carefully so you can determine where the trouble is starting. It's less likely to be a problem if you keep several catfish together. Most species of catfish can live peacefully in a community with other fish, but carnivorous ones will eat fish who are half their size or smaller. Despite being hardy where water quality is concerned, catfish can be very vulnerable to the side effects of medication. If you need to medicate your main aquarium you should first remove them to a quarantine tank. Catfish are great fish for beginners and can also be a valuable addition to a mature aquarium. Though they can be shy at first, once they've established themselves they're lots of fun to watch and interact with. You'll soon find it hard to imagine how you ever got along without them! I was wondering what types of fish get along well with catfish that are top or mid level swimmers. I have an upside down catfish, a pictus catfish, a plecostimus that all interact with eachother, and an African dwarf frog in a well planted and maintained 20 gallon tank. The tank housed other fish, but they have died over the past few years. It's normal for fish to lose scales from time to time. When this happens, the remaining scales grow larger to fill the gap. Unfortunately this does mean that the exposed skin is vulnerable to infection in the interim. It sounds as if this catfish has a fungal infection where the scale is missing. A standard anti-fungal remedy like Interpet Anti Fungus should clear it up, though catfish can be sensitive to some such remedies, so check the bottle before you use it. What is wrong with my catfish? It recently lost a scale but i dont know how and a couple of days later it developed a white fluff in a spherical shape, what is this? Help would be much appreciated asap please!! What types of mix of cat fish can I have in my tank ? hoping they don't destroy each other. I have 8 different corys and 2 feather tip cats at the moment and want to add a few more.